Baguio can be restful yet exciting! It all depends on how you like your vacation. Blessed with a strong community spirit, a desire to showcase all our vibrant diversity, Baguio City is simply the best place to hold any outdoor activity for up to tens of thousands of visitors because of it's fantastic climate, parks and wide open spaces. And we do just that -- year round! Below is a list of our institutional annual festivals from the Panagbenga to Silahis ng Pasko. 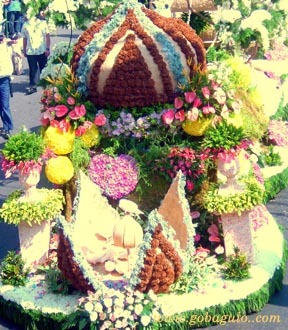 The Baguio Flower Festival started in 1994, is one of the largest and most successful festivals in the Philippines' Fiesta Calendar. Baguio, as the City of Flowers is in full bloom with a month-long series of events highlighted by the Parade of Floats and Band and Streetdancing Competitions held on the last weekend of February. Highlights include landscape competitions, art exhibits, golf tournaments, flea markets and simply a whole lot of fun activities for tourists and residents alike. The Roman Catholic Holy Week kicks off the Philippine Summer Vacation (SUMVAC - April to May) festivities with a large influx of visitors arriving to escape oppressive lowland temperatures to enjoy Baguio's cool climate. Civic and business groups line up a host of activities for the enjoyment of visitors of all ages. A series of Christmas activities of the City of Pines that focuses on the youth (which comprises about half of the city's population) with Christmas carol competitions called Himig ng Pasko, Share-a-Toy, sports tournaments and the like.